This group was the most well known of the German political rock scene. Few countries had so many politically active bands as Germany. Floh De Cologne was originally a radical theatre performance group of students that performed cabarets at the universities of Cologne from 1966 onwards. A natural target for political agitation at that time was the Vietnam War, and Vietnam (1968) became the title of Floh De Cologne's first album, the result of a collaboration with Dieter Suverkrup (recorded several political rock albums for Plane). All royalties gained were transferred to a foundation for helping the Vietnamese. They appeared at the Essen song festival in Autumn 1968. With their blend of political lyrics, (German) humour and lunacy they became known as the German answer to The Fugs and Mothers Of Invention. Not surprisingly they were signed to the number one underground label then: Ohr records. Fliessbandbabys Beat Show was released in the Summer 1970. It was the first of the legendary Ohr LPs. This was a somewhat unique rock cabaret where the group, parodied different rock styles. A highly entertaining effort containing much silliness and a sort of Bonzo Dog-like nostalgia, only that Floh De Cologne were as German as the Bonzos were English! It was all produced by Julius Schittenhelm in Cologne during April 1970. The sleeve showed a 19 point step by step guide on how to become politically active. I wonder if anyone converted to Marxism on the strength of this record? Their next project was Profitgeier (1971), 'profit vultures', that dealt with all of the disadvantages of the capitalist system. The record itself was pressed on glowing red vinyl, as if the group's political standing point wasn't evident from the agitated texts. Also the sleeve had a special gimmick - guts to pull out from the wounded profit vulture' Musically this was a highly imaginative rock opera, including even more parodies and silliness, perhaps the closest the band came to The Fugs and Mothers Of Invention. The group members acted as different characters or proclaimed political views on the class divided society, speaking with funny or strained voices. This was executed at a furious tempo, making the plot difficult to understand for non-Germans. Anyway, this was the essence of Floh De Cologne, captured on a peerless album. 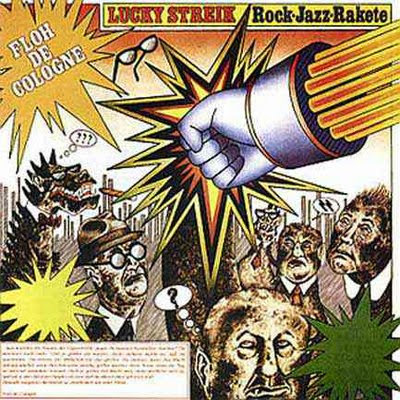 If judged by Lucky Streik (1973), the group continued to make cabaret like live performances. It was recorded on 25 November, 72 in Gummersbach by Dieter Dierks. A rich repertoire was featured, but as a whole, the double album didn't live up to the standard of the two previous albums. Still there were plenty of humorous tracks to enjoy. A large poster was also included. Geier Symphonie (1973) again caught the band in great shape, this time merging all their previously known styles into an outrageous rock symphony that has to be heard to be believed! But beware, this is hardly easy listening! The folding of Ohr brought Floh De Cologne back to Plane. Their next album Mumien (1974) was a concept album about the then recent coup d'etat in Chile, lavishly packaged with a large booklet full of background information. Regrettably, the musical footage of this 'Kantate fur Rockband' was below par this time. However, as an audible, leftist newspaper it was excellent. This was their first album with Vridolin Enxing. He replaced the departing Markus Schmidt. Tilt! (1975) dealt with more local national problems like youth unemployment. After this album, the group's main lyric writer Gerd Wollschon left, and their subsequent releases were only pale imitations of their previous political concept triumphs.